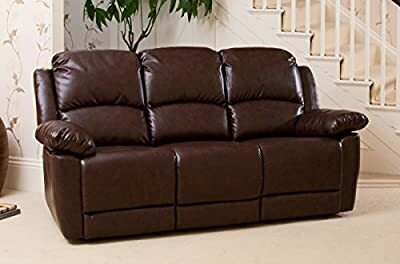 Simply Sofas are currently selling the sought after Lucerne Luxury Leather Recliner Sofa Suite - Different Configurations and 3 Colours Available for a brilliant price. Don't pass it by - purchase the Lucerne Luxury Leather Recliner Sofa Suite - Different Configurations and 3 Colours Available here now! The armchair and both seats of the 2 seat recline, and on the 3 seat couch the outer 2 seats recline. The items will be sent from our warehouse into the carrier network, once they receive the items they will call you to set up a shipment date and approximate shipment window. Please ensure that you provide an up to date contact telephone number so the couriers are able to contact you to set up shipment.